Also Called: Milk plant, wild asparagus, silkweed, wild cotton. Stems: Erect, usually solitary, stout, simple, sparsely to densely pubescent. Leaves: Mostly opposite, ascending to spreading, broadly egg-shaped to elliptic or oblong, 2.4 to 12 inches long, 2.2 to 4.4 inches wide, firm, sparsely to moderately soft hairy above, finely woolly below; tip blunt or rounded with short, abrupt, sharp point; margins not rolled underneath; on stalks .1 to .6 inch long. Inflorescences: Umbels, few to several, 20- to 130-flowered, in upper leaf axils; on stalks .5 to 5.5 inches long. Flowers: .4 to .7 inch tall; stalk slender, .6 to 1.8 inch long; calyx lobes 5, lanceolate, .1 to .2 inch long, green to purplish, densely pubescent; corolla lobes 5, elliptic-lanceolate, .25 to .4 inch long, reflexed, rose to purple or rarely white, minutely hairy on the back; hoods ovate, attached near base, spreading, up to .2 inch long, somewhat fleshy, tip rounded, margins with a pair of prominent teeth near the midpoint; horns sickle-shaped, united to lower 1/3 of hood, arching. Fruits: Pod, spindle-shaped, 2.8 to 4.4 inches long, .75 to 1.4 inch thick, smooth to densely covered by projections, woolly, erect to ascending on downward-curved stalks; seeds many, broadly ovate, 1/4 to 1/3 inch long, tufted with long, silky hairs 1.4 to 1.8 inch long . Habitat: Found along banks of ponds or waterways, roadsides, edges of woodlands, and in open disturbed sites or waste areas. Origin: Even though "syriaca" means Syrian, this plant is native to North America. Toxicity: All parts of this plant are poisonous to a greater or lesser degree. The shoots were thoroughly boiled with a change of water before being eaten. Uses: In the spring, a number of Native American tribes cooked the young shoots and ate them as an asparagus-like food. 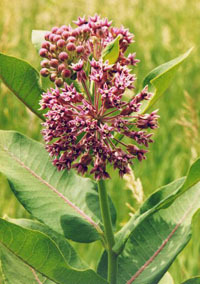 Common milkweed was also used medicinally by Native Americans.